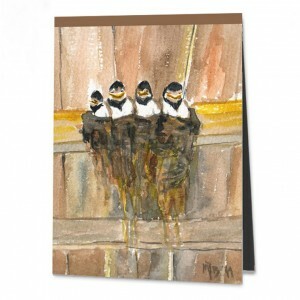 When I saw the four adolescent swallow youngsters in their nest, I burst into laughter and hastily conjured up my painting equipment from my rucksack. They sat crowded together in a nest that was far too small but they nevertheless seemed as content as Lord Muck with their situation and the world around them. While I painted, a movement quickly took hold of the group. One of the birds fluffed itself up, pushed his neighbour to one side and this neighbour, in turn, rammed into the third bird – until the fourth could no longer hold on and fell out of the nest. Following a few beats of its wings, the bird attempted to force its way back between its siblings. With this, the cycle of pushing, flapping out of the nest, returning again and squeezing in among the other birds continued for some time until the swallow parents suddenly flew through the barn door with worms in their beaks. The young birds now cowered diminutively in their nest. With their mouths stretched upwards and their little beaks wide open, they were a far cry from the lively bunch of rascals from moments ago and instead appeared tiny and half-starved. The food was devoured rapidly – and, in the blink of an eye, the parents took wing again and headed out to find new food. The parents were barely out of the door when the young swallows spread themselves out big and broad once more, crouched harmoniously beside one another and looked at me with – it seemed – a friendly grin, before the pushing and shoving began anew. It occurred to me that it is normal to talk about baby birds. There is, however, no term for “teenage birds”. But the phenomenon certainly exists!